In January, I assess the stars and clunkers of the past year's wardrobe purchases. 2012 was unusual: First, I lost several treasured pieces of jewelry that I replaced. Second, I dropped two sizes, so there were tailor's bills and a few replacement pairs of pants that I normally wouldn't have to buy. Maybe I'll earn an A if only because most of my 2012 budget was spent on "A"s: Alterations and Accessories. 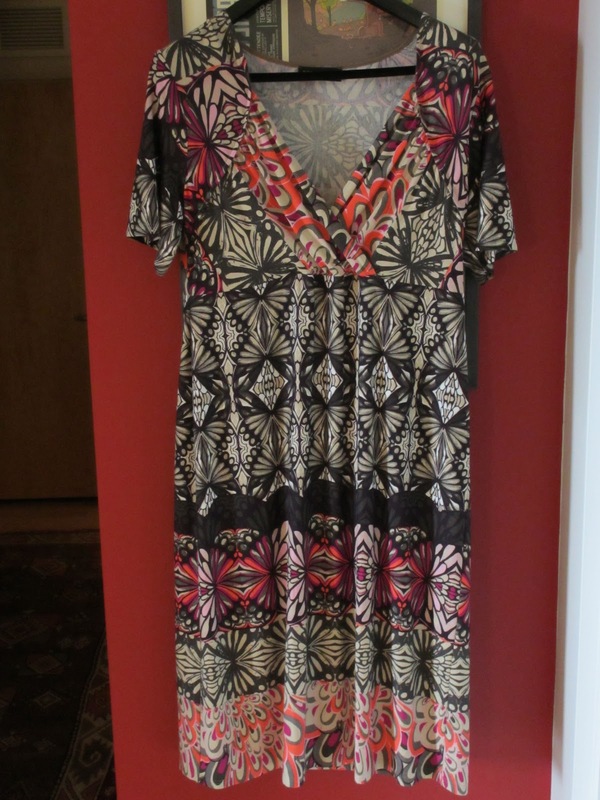 Here's an atypical purchase: a jersey Doris Streich dress in a bold pattern, bought for a summer party. Such a departure for me! Supremely comfortable, it was worn several times and I hope will be useful for upcoming occasions and hot-weather travel, if its needed alteration is successful. Still, it is "that dress" and proves the shorter shelf-life of pattern or print. 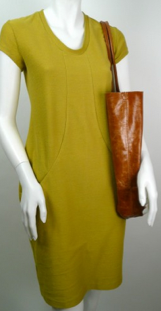 The citron green "Emma" dress (by Muriel Dombret) was worn far more, quickly earning its price. Above, two accessory purchases: a pair of sand Arche sandals (washable nubuck!) 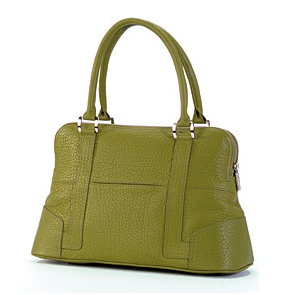 and a leaf-green Groom bag, a replacement for a worn-out one. The costliest single item was the reno of my fur coat. After four years of diligent tracking, I could stop record-keeping, but will continue. Without that accounting, impulse-spending and excessive stockpiling creep in. Do you record your purchases? What has returned exceptional value and what was merely "a good idea at the time"? Next Tuesday, Part Two: The Three Questions I ask before buying. I hope next January I can be like you and say that I dropped at least two sizes!! Thanks for being a great example! Pam: I'll say again it was alarmingly high blood pressure that motivated me! And I found MyFitnessPal a terrific free resource and encourage you to check it out. 2012 was an extremely spendy year for me - after all I had a job;). So far this year I've acquired two pieces of outerwear and a new bag. I should be pretty much done. But it's been so much fun to be living high on the hog again that I'm being gentle with myself in terms of enforcing thrift. It's retail therapy of a particular sort. I've never kept track of clothing expenditures, but this may be the year to start. We are recording every expenditure this year to analyze what we actually do need come retirement (still a few years off). Included in all the recording will be clothing purchases. I did not purchase as much clothing in the last year as in the last few years. There is a sweater tunic (black and white) that I have yet to wear--so that one is shaping up to be a mistake. I bought it with the idea that I could wear it on winter days when it is not cold enough for a coat. The problem is that we have had days that are too warm to wear it at all and days that are too cool to wear it alone as planned. I am going to Make myself wear it today and see how it goes. I did buy two new coats this fall. This is unusual because of our warm climate. I didn't want to get caught needing a coat for travel and having to settle for a quick last minute purchase. I'm pleased with the two coats (have worn them!) and bought them with an eye toward years of use. I would love to drop two sizes. I'm trying to get motivated to make that happen. Duchesse, I like the print dress and predict you will continue to have fun wearing it if the alterations work out. Pseu: What have you done with the unsuccessful experiments items? What did you learn? I guess this is a request for a post! LPC: I know what that's like.- and it's fun after a dry period to fulfill some longing. Mostly retired, I'm now on the other side of the field, with both far less need and less discretionary income. Susan: If interested in evaluating retirement needs, clothing expenditures are important to track as are *all* personal expenses (hair, gym, drycleaning, gifts) and donations... in fact, all expenses. We were quite surprised when we did this. We spent way more in some areas than we thought and less in others. I can see how a knit tunic would be less useful b/c if day turns warm you can't take it off like a long cardi. Have bought a lot this year as well. Biggest splurge was my dress for my daughter's wedding - but I love it and will wear it for any dressy occasion I ever go to. I haven't experimented at all, which is fine, because I know what i like - but did need to update things, which I did do. No mistakes this year! Wow two dress sizes is worth applause! I am quite smitten with that citron shade and I can imagine with your hair colouring and skin tone it would suit you to a T.
This is so inspiring! I'm going to take this on for 2013. Do you calculate cost per wear, too? Do you count things like underwear and tights? Kathy: No mistakes, terrific- and what fun to shop for a special, happy occasion dress. hostess: Thank you. Funny, that yelloed-green colour used to be hard to find but is now if not everywhere, on the radar. sisty: I don't calculate cost per wear but have some idea if I wore it a little or often. I note rsp and sale price, if different. Some things, even if I wore them a lot, would not seem worth it. $250 jeans come to mind. I can find ones I like just as much for far less. I do count all items, and mark which are replacements. I don't record purchases, but the idea is interesting. I purchased quite a lot this year, preparing for a trip. Happily, however, I have worn those purchases constantly and didn't regret a single one. The trip actually changed my manner of dressing. The dresses your bought at Muriel Dombret (there was another, wasn't there?) were really lovely. I still anticipate a trip to Ottawa, so I may still get there yet. To answer your question asking what has returned exceptional value---the answer is an easy one for me. I have purchased several Eileen Fisher items which I have worn over and over and over again. I have to confess---all of them are black (or gray) and all are made of viscose jersey. I purchased several EF dresses--some sleeveless and some with three quarter sleeves. They are versatile, flattering, and comfortable. I find myself reaching for them many times. I also purchased long sleeved tops in viscose jersey (both black and gray) that I run the risk of wearing out. Also, my knit ponte pants in gray and in black have been workhorses in my wardrobe. I accessorize these items in various ways--with both jewelry and scarves. They have been excellent purchases. I eagerly await your next post on the topic of wardrobing. I want to know the questions that you ask before buying. Kristien62: I find myself wondering how the trip "changed (your) manner of dressing"- am going to guess you found you could do well and even enjoy fewer things. Or??? Yes, the other Muriel D. dress is such a dark navy it looks black and does not photograph well, but it's quietly beautiful. Do hope you can get there. If possible, meet Muriel, she's wonderful- though a bit shy about her talents. Susan: Jersey (in my case, black) is the foolproof travel wardrobe- I also use it everyday. Glad you have found your magic pieces! Your post last year, scoring your purchases, is what spurred me to really take better consideration of what I wanted to do with my clothing. Like Kathy, no real mistakes this year, unlike prior years. This year's goal is a pair of rain boots, a Barbour coat in a size that fits (I have a terrible habit of upsizing, wind up looking like I borrowed someone else's clothes), and a beautiful navy jewel neck cashmere sweater. Tougher to find than I ever expected. And a really nice tote. Other than that, maintaining the stuff I own--I really like it, so I better treat it well! Envelope for clothes receipts each year. After year end, I add them up. If the number seems huge, I tell myself to "watch it!" If the number seems acceptable for my budget, I tell myself, "good work" ..
Gretchen: Sweet success! And I laughed about upsizing- guilty, too. BTW Eric Bompard have their cashmere round-neck on sale @ -30%. Navy, of course and many other colours. materfamilias: The Paris store is but a skip from the area you've been staying in- 13 rue du Cherche-midi, the shoe-shopping heaven street. It's always on my list. My daughter would love that citron dress and looks good in that color too. I bought only a few new items last year: two pairs of skinny jeans (worn a lot), one pair of Born black boots (only worn once, because of warm weather), and a long black sweater coat (worn a lot and looked great till I washed it--typical Chico's so-so quality--luckily reduced vastly). Very impressed by your critical eye--turned on aesthetics and value. Duchesse- prior to going abroad (my first trip), my closet consisted of many separates, dresses, shoes, etc. that had no relationship to each other. I would impulse-purchase without thought to what I might pair with the item. And I dressed in "outfits"--things that I felt only went with that look. I rarely mixed them up. While searching the blogs about how to pack for the trip, I was captivated by the capsule wardrobe and how to make many looks from few items. And scarves! I hadn't worn them in years. Packing for the trip changed my perspective entirely. I have culled the closets and continue to do so. I dress in the items I bought for Ireland constantly, in different combos. When spring comes, I will do the same the spring/summer clothes. Sorry for this lengthy post, but it really has been revolutionary for me and I look so much better. Frugal: My intensely frugal mother always insisted on great quality. That's the problem with Chicos and other similar retailers. If we find something we like, we can't keep it for long, as it isn't made to last. Kristien62: Thanks for the elaboration. The prevalent American way (I grew up there) was to add more and more to one's closet- and it does not serve as well as your approach! Oooh I would love to see your Irish clothes. Duchesse -- I;ve had my eye on a pair of the Arche Denzon sandals which you purchased. They look comfy w/ a bit of an "edge", owing to the zipper. Are they as comfortble as they look? I have a very narrow foot, especially at the back/heel area. In your estmiation, do you think they would be well suited to a narrow foot? My purchases this year will be on the conservative side. I have a few voids as far as basics are concerned -- some casual tshirts and chinos. I work from home now, so my wardrobe is largely casual though not "schleppy" just because I'm seen by few! Gayle: I'd be in trouble if I let it run for a year, as I can 'forget'- in fact, ignorance of just how much I was spending is what led to the system. I take a general tally every season. Anon@1:13: It's so hard to gauge someone else's foot and offer useful advice! I wear B width, which is sometimes on the wideish side, don't have an especially narrow heel. They are very comfortable and offer a bit more cover than a strappy sandal, making them good for walking and especially travel. My only useful clothing comment for this year was that I ended up returning the Lands End cashmere cardigan I'd ordered (a wonderful neutral heather, but so thin!!!) when I found two USA made Cut Loose boiled wool swing coat jackets at a local shop, cuter and CHEAPER (around $168 US for Lands End v $130 US for Cut Loose). And more flattering than a super thin cardy. Want more Cut Loose now!!! The swing coats are well made and I'll be wearing them with turtlenecks and scarves to teach and for client meetings until it's too hot for boiled wool. No new bags this year, one new pair of Danskos. Good on my plantar fascia problem, but the dark red is not as versatile as I'd thought (I wear it with jeans and feel like a small child). Artful Lawyer: Marvelous finds! When boiled wool is light enough to wear indoors it's a great weight and the fabric shoes of luscious colours so well. I like Cut Loose tees and have admired other pieces. You can find vendors on line, one is Birdielou.com. And I'm off to download MyFitnessPal right now! Duchesse, last year in January I decided to reduce the size of my wardrobe. I threw out the old, soiled, misshapen, not fitting, items or the ones which were mistakes and could not be altered. Some I altered to make them wearable. Then I made a complete list (audit) of my clothes, - the numbers of items (eg 9 pair black trousers, 30 T shirts etc). Then I put half the clothes away and wore the other half endlessly until some of them qualified to be thrown out or made into gardening clothes. I promised myself I would buy NO new clothes for 12 months. I survived until August, then I went overseas and fell off the wagon. I bought a few items which did not duplicate an existing item (no more black pants or T shirts). And I bought a few pieces which were either something I always wanted (full length suede coat) or something which I just fell in love with (tote bag in Spain). So, at the end of the year I had reduced the size of my wardrobe (about 25% in some clothing categories, 5% in others). This certainly makes getting dressed a much easier decision process. But I did not reduce the amount of money I spent - which was oK becuase it was not the point of the exercise. Judith: Sincerely and reverently, wow! Do you know the technique where, when you wear something, you turn the hanger? At the end of the season you can see easily what was used and what is surplus or just not loved. I've tried it- effective! Thank you for your downsizing testimonial, it inspires me to keep from closet creep I'm sure it will inspire others- as well as your girlfriends. tweedlibrarian: Wish I could see your vintage coat, love that sort of thing! Were the ballet flats not giving enough support? (That's my problem with them.) Good luck on MFP! I do hope you can still wear that beautiful citron denim jacket; it suits you so well. Usually that is something one can wear fitted or looser (over a Muriel Dombret dress; I'd be inclined to pair it with the ink-blue one, not the similarly-hued one. Often ballet flats look very ugly on my feet, which are wide in front and always have been, even when I was slender. I love them, but have been happier with pretty Chinese slippers, a bit more closed, as a flat for not-too-dressy nor too sloppy meet-ups. There are also more serious shoes along those lines. Very nice ballerina-like flats but a little more closed. Thought "Henderson" but that wasn't the line. I have years of wardrobe purchases in my Filofax; I record the retail price and if I obtained on sale. Extremely enlightening discipline and fun to look through. I know exactly what I spend. Duchesse, re my comment and your reply above... thanks for the coat hanger tip. Now that I have the written audit (in black ink) I get a great deal of pleasure in crossing items off the list IN RED INK when they are discarded. So at year end I will have a very graphic depiction of the state of the wardrobe. I suspect that I have a 5 year project ahead of me before I have a lean, mean, totally wearable and totally loved wardrobe. But for this year at least, even if I no longer really love or even like an item I will wear it(eg to do the grocery shopping). I am not simply throwing things away as I believe that I need to get at least some wear out of the 'mistakes'. Do you know the Blog called the Vivienne files? www.theviviennefiles.blogspot.com.au/ She argues that you really only need 30 items and she plays around with mixing and matching. She rails against people buying on impulse or without thought. That by doing so you allow yourself to be manipulated by the stores, the advertisers and the catalogues which pop up in your mailbox. The argument is all about taking control and being in charge. Not spending money just because someone else talks you into doing so. Control! Not victimhood! lagatta: Can wear that jacket, as I have changed from a Bartlett pear to a Fiorelle- not much change in the bust! Lane: I'm a Filofax woman, too... are we natural-born recorders? But I also have a friend who doesn't write down spending but can tell you within three dollars how much she has spent for a given period and can recall the price of anything she's bought over last 20 years! Judith: I deeply enjoy Janice's blog, especially her forthright wake-up call to overbuying. And you, with your black and red ink: you •are• on a mission! I applaud you for jumping off the reflexive consumption bandwagon while still enjoying the pleasure of a well-made item. One of the comments in "Simple Isn't Easy' that's stuck with me is, "No matter what you paid for it (or what a bargain it was), if it's no longer in good condition or not right, let it go." The Dombret dress is gorgeous! I didn't buy much last year. I did buy quite a few things the previous year but didn't end up liking/keeping most of them. My style was evolving so fast that the rate of mistakes was getting depressing. I took a break. I noted a reference to "Simple Isn't Easy" by Amy Fine Collins and the late Olivia Goldsmith in one of your previous posts (which isn't there now) and just wanted to say how much I love that book. Great advice.